Pure whey protein is a top quality protein source, with a high biological value (HBV). It contains all essential amino acids your body needs and it is particularly rich in branched-chain amino acids (BCAAs). 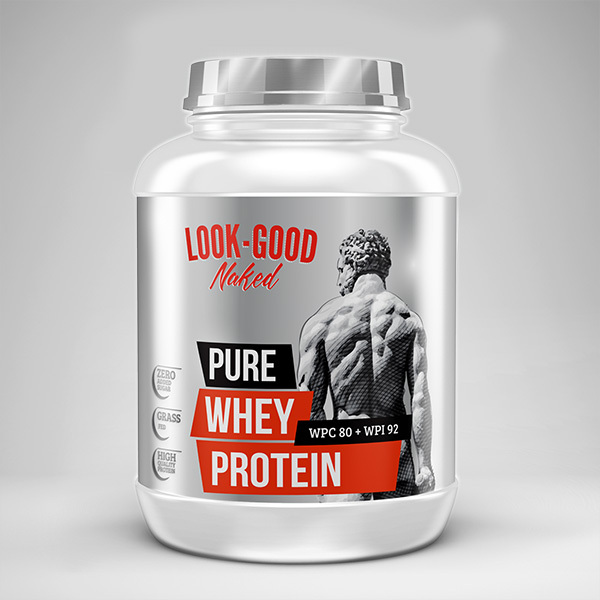 Pure whey, when combined with resistance training can improve muscle protein synthesis and therefore it promotes lean muscle tissue growth. Moreover it has some great benefits for muscle recovery and repair as well. Whey is a filling macronutrient that improves satiety, helping you to cut down calories the calories you consume (if you need to). Therefore its possible benefits include weight loss and lowering cholesterol levels. Whey in general is highly digestible, and it is absorbed quickly compared to other proteins, but our Pure Whey protein blend is further enriched with digestive enzymes – bromelain and papain – that enhance digestion, resulting in even higher levels of absorption. PURE WHEY PROTEIN was designed by the best flavor specialists to be extremely delicious. We provide 3 extremely rich and fulfilling chocolate options. The best part is that you can enjoy a protein shake that tastes good, even though it contains zero sugar or artificial sweeteners such as aspartame. Therefore, you are certain that each sip you take, you’ll be supplying pure fuel to your muscles. Ingredients: Whey Protein Concentrate (from Milk, Emulsifier: Soy Lecithin), Fat-reduced Cocoa Powder (10-12%), Flavors (Chocolate, Dark Chocolate), Sodium Chloride, Sweeteners (Sucralose, Acesulfame K), Thickener (Xanthan Gum), Whey Protein Isolate (from Milk, Emulsifier: Soy Lecithin), Bromelain extracted from Ananas comosus (1200 GDU/g), Papain extracted from Carica papaya (1.5 FIP U/mg). Allergen Warning: Lactose from Whey. Manufactured on equipment that processes products containing active ingredients derived from celery, gluten, lupin, nuts, sesame and soy. Blend 1 scoop of pure whey with a glass of water or milk if you prefer and enjoy a mouthwatering protein shake. Consume 2 to 3 servings every day. Ideally consume 1 of the stated servings within a few minutes of your workout, in order to help rebuild damaged muscle tissue. TIP: Pure whey protein powder tastes great baked into protein foods. You can use it to replace some of the flour and sugar in cookies, cakes etc.